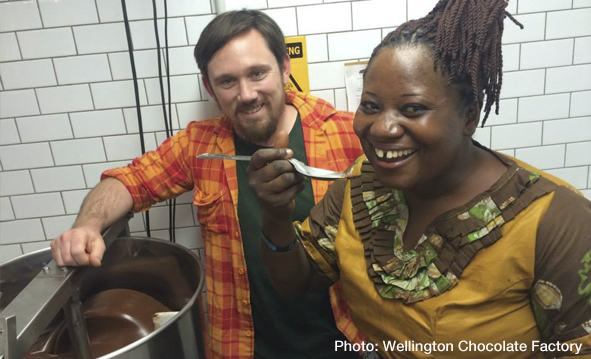 Rose Mensah, a cocoa bean farmer from Ghana came to Wellington to kick off Fair Trade Fortnight and share her story about how being in a fair trade co-op benefit’s her community. Hearing her story lead me to ask Wellington fair trade stalwarts, Christian from Trade Aid , Matt and Kate from All Good Bananas and Rochelle from Wellington Chocolate Factory about the effects on their suppliers and their products from committing their businesses to being fair trade. I also chat to Pravin Sawmy of Fairtrade New Zealand about NZ’s astounding growth in Fair trade products is in just 9 years. This entry was posted in Enterprise, Social & Civic and tagged Africa, Ethical, Fairtrade, Food by lauriestarfish. Bookmark the permalink.